U.S. Orders are shipped via UPS or USPS (United States Postal Service) depending on package size. 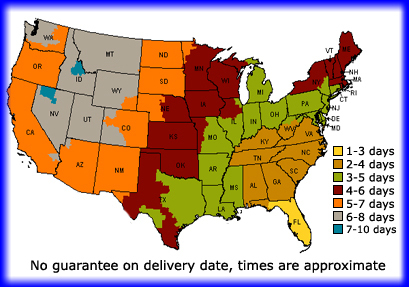 See map below for estimated shipping times by location. We ship internationally via the U.S. Postal Service to most countries in Europe, the Carribean, South America, Asia and Oceania. See the chart below to find out if we ship to your country. International Shipping Most of the products that we carry are available for international shipping. International shipping costs are calculated by our system but is not uncommon that specific country regulations may require us to contact you to confirm your shipping options. You will be contacted via email between 48 and 72 hours from the date of the order. You will be notified of the final shipping cost before your order is processed. Due to the daily fluctuation in exchange rates, all price quotes will be given in U.S. dollars only. Shipping costs do not include duty, tax, or brokerage fees. La mayoría de los productos que vendemos están disponibles para ser enviados internacionalmente. Los costos de envío internacional son calculados automaticamente por nuestro sistema, pero es común que las regulaciones de algunos países en particular requieran que lo contactemos para confirmar las opciones de envío. Usted será contactado dentro las siguientes 48 a 72 horas a partir del día en que la orden ha sido colocada. De la misma manera, será informado del costo final de envío antes de que su orden sea procesada. Debido a la diaria fluctuación de las tasas de cambio, todos los precios están calculados en dolares de los Estados Unidos. Los costos de envío no incluyen ningún impuesto ni arancel del país al cual es enviado el producto. La maggior parte dei prodotti che portiamo sono disponibili per la spedizione internazionale. I costi di spedizione internazionali sono calcolati dal nostro sistema ma non è insolito che regolamenti di ogni paese specifici può richiedere che noi abbiamo la necessita di contattararlo per confermare le sue opzioni di spedizione. Lei sarà contattato via l'email tra 48 e 72 ore dalla data dell'ordine. Lei sarà notificato del costo di spedizione finale prima che il suo ordine è elaborato. Dovuto alla fluttuazione quotidiana nei tassi del cambio, tutto le citazioni di prezzo saranno date nei dollari americani soltanto. I costi di spedizione non includono il dovere, la tassa, o gli onorari di intermediazione. · Please consult our Online Staff about the product availability and prices when ordering from this or any other online catalog. Pricing does not include shipping. · Items marked with asterisk (*) may require prepayment by money order, check or credit card. These are special order items that we do not stock but are willing to order from our vendors at your request. These special order items are paid for in advance, non-returnable and non-refundable. · We apologize for any discrepancies caused by typographical, clerical or printing errors and reserve the right to correct them. We are not obligated to sell items at mis-marked prices. We apologize and make every effort to avoid these errors. · We are not obligated to carry any item that has been discontinued by a manufacturer. All items are subject to availability. As the manufacturers' product lines change, our product line changes also. · At time it is possible that a product can be on backorder through the manufacturer, we encourage our dealers to keep up with their stock, and contact other dealers if need be to get the product to the customer. For Returns purchased through online store: they must be returned through mail. Be sure to include a copy of your invoice or packing slip, if available, and write the reason for each returned item. Freight must be paid by the customer. There is NO REFUND on shipping fees. Each item returned for refund there will be a $15.00 restocking charge. There is no restocking charge on an exchange; reshipment fee of $12.00 applies for all exchanged. Items returned for exchange or refund must be returned within 14 days from receipt date in original and unused condition (unless defective). · These terms represent the policy of pwonly.com and are current as of August 14, 2015. · INTERNATIONAL CUSTOMERS: The following statement must be written on your invoice enclosed in the return package and on the Custom's Declaration on the outside of the package: U.S. GOODS BEING RETURNED FOR REPAIR OR EXCHANGE. · When you place an order, we need your name, credit card number, e-mail address, billing address, shipping address and telephone number. We'll e-mail you order confirmation / shipping confirmation. In rare cases, we do contact customers by phone if there's a question about your order. Users may opt-out of receiving future mailings; see the choice/opt-out section below. · Our site's registration form requires users to give us contact information (like their name and email address). We use customer contact information from the registration form to send the user information about our company. The customer's contact information is also used to contact the visitor when necessary. Users may opt-out of receiving future mailings; see the choice/opt-out section below. · This site contains links to other sites. www.pwonly.com is not responsible for the privacy practices or content of such Web sites. · We may use your IP address to help diagnose problems with our server and to administer our Web site. Your IP address also may be used to gather broad demographic information and to recognize customer traffic patterns and site usage. · Cookies are alphanumeric identifiers that we transfer to your computer's hard drive through your Web browser. They make it possible for us to recognize your browser when you visit. By doing this, we can personalize your return visits and save you time during checkout. In order to enjoy the benefits of being a registered user, your browser must be set to accept cookies.